Captain Farrar was a member of the English Alpine Club in the 1920s? A snow climb that varies with the seasons. Slots can cut access at times. When in good condition, usually earlier in the season, this route also offers good access to Iceland Col, Mts Kensington and Hulka. The top of the peaks are small rock scrambles. N Barker, GDT Hall 27th Dec 1935 from Agnes Bivvy. 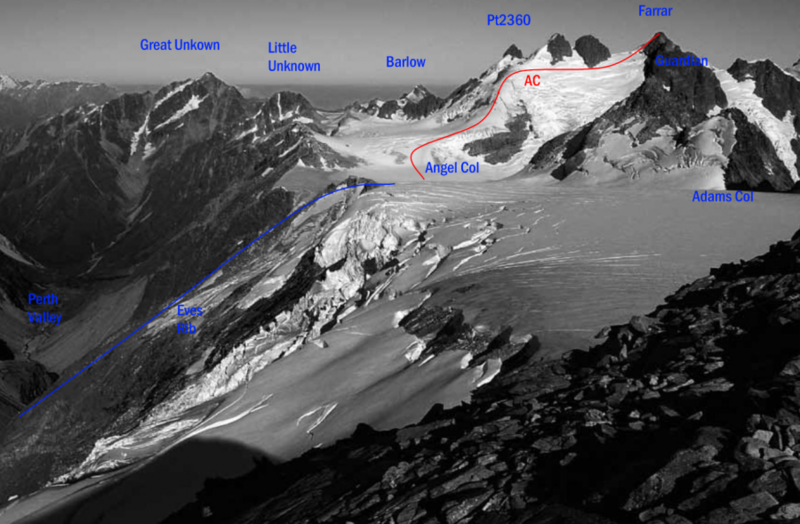 The Arethusa Glacier has a couple of icefalls that need to be passed. See the Arethusa Glacier notes above. From the 1940m contour, the usual route is to sidle up snowslopes onto a shoulder off Mt Hulka and cut back south east onto the plateau. A short steeper scramble on rock and gravel leads to the highpoint at 2424m. Between the icefalls in the Arethusa, it is sometimes possible to head south up the true right of an icefall that drains Hulka and Farrar, offering a more direct approach to the plateau north west of Mt Farrar.